The next time you go to a techno dance party, more commonly referred to as a rave, make sure you dress properly for the occasion. 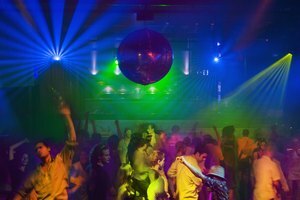 If you're not a "raver," you may not be sure about what exactly to wear to a dance party with fast-paced electronic music. Although there are no specific rules, stick to a few suggestions to fit in at the party and feel comfortable dancing the night away to techno music. You can wear almost any top to a rave, as long as it's loose and not heavy. You'll be doing a lot of dancing, so wearing a loose top is important to keep you cool. Wear bright, loud, neon-colored tops, if possible. Some shirts that have images that light up using electro-luminescence and IC chip technology are available in shops that sell clothes especially for raves. Shirts with glitter may also be worn so they sparkle under the flashing lights on the dance floor. Like tops, any bottom may be worn at a rave, and ones that are loose and baggy are also ideal. Common pants are baggy jeans, tracksuit pants or brightly colored pants or shorts. If you wear pants, make sure that they're not too long, or you might slip and fall while dancing. Additionally, some woman wear long, comfortable skirts instead of pants. Denim or cotton skirts, usually in black, can be worn, or you can wear leggings in any color. It's important that you wear comfortable shoes to a techno dance party, because it's most likely that you'll be dancing for long hours. Refrain from wearing boots or high heels. The best kind of shoes to wear are your most comfortable sneakers. However, flip flops, or any other shoes that you can wear while standing and dancing all night, may also be worn to a techno dance party. One of the most important accessories to wear with your outfit is bright, neon glow necklaces and bracelets. Wear as many as you can as possible so you stand out at the party. Jazz up your outfit with anything that lights up, from a pair of shades to jewelry. Other accessories you can wear with your outfit are colorful suspenders, belts, LED gloves and hair accessories -- even a brightly colored wig. Wear a whistle around your neck that you can blow to the beat of the music on the dance floor. 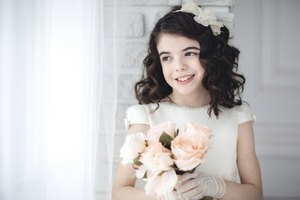 What Is Appropriate Attire for a First Communion Party? What is Resort Chic Wear?